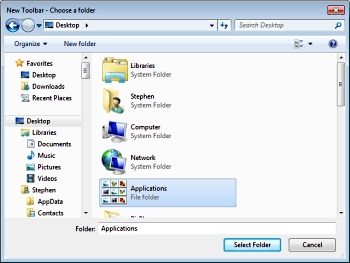 In Windows XP and Vista you could put a shortcut to a folder on the Taskbar by dragging the folder to the Quick Launch toolbar. By default, Windows 7 doesn't have a Quick Launch toolbar. However, you can still put a shortcut to a folder on the Taskbar. To put a shortcut to a folder on the Taskbar, right-click on the Taskbar and select Toolbars > New toolbar... and in the "New Toolbar - Choose a folder" dialog box that appears, navigate to the folder, highlight it, and then click on the [Select Folder] button. The new toolbar will appear on the Taskbar as a popup menu. You can now access the contents of the folder from your Taskbar. 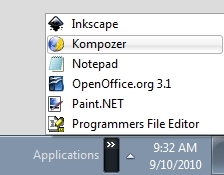 You can add often used programs and files to the folder for easy access. Although Windows 7 doesn't have a Quick Launch bar by default, you can add it. Open the "New Toolbar - Choose a folder" dialog box as before. In the dialog box, copy and then paste the following line in the Folder text box, then click on the [Select Folder] button. The Quick Launch bar will now appear on the right side of the Taskbar. To hide the Quick Launch text and program titles, right-click on Quick Launch, and in the popup menu that appears, uncheck Show Text and Show title. You can drag the Quick Launch bar to the left side of the Taskbar.